(Fig. 2) 25 foot geyser of water. Prior to construction, it was necessary to vacate the entire basement and the 1971 building to the West which housed galleries, 20,000 objects from the decorative arts collection, 20,000 costumes and accessories, the 1800 piece painting and sculpture collection, as well as newspapers and architectural drawings. Exhibitions were dismantled, and vast collections were carefully, and thoughtfully prepared for storage off-site. Each department planned and systematically carried out the packing of it's own collections, and eventually the move of some of their offices to a building some distance from the museum. Fig. 3. view toward the museum. Burst water main. 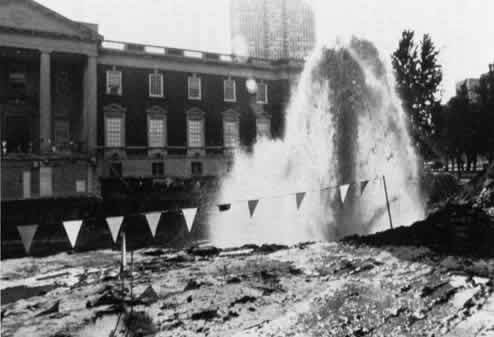 Since the historical society, like all other major museums in the city, resides on Chicago Park District land, immediate attempts were made to contact Park officials to determine the exact locations of their water mains and shut-off valves. They supposedly had not made the information available when requested by the construction company. On that late Friday afternoon, with water rising in the 12 ft. deep excavation adjacent to the building, the Park District could not be reached. The Chicago Water Department, the news media, and the Society's staff photographer were, however, quickly on the scene. Fig. 4. By 7 pm the water level was at 9 feet. At 7:20 pm,, the Park District arrived with plans that located the valves at distant corners of the park surrounding the Society. 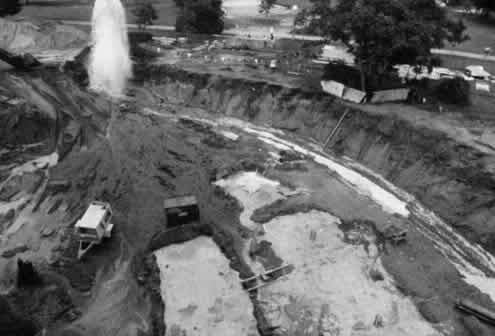 At 7:40 the valves were closed, stopping the water at a depth of about ten feet in the now nearly filled excavation. But within five minutes, the basement floor began to heave, and water poured in. Then the 8" thick cement floor buckled, and all the water, an estimated ½ million gallons, entered the building in a wave. Fig. 5. Immediately after flood water entered basement. The fire department had arrived on the scene earlier, but their attempts to pump water from the excavation had not been successful. Once staff were safely out of the basement, the fire department prohibited re-entry. We had to begin the recovery process from home. It took most of Friday evening to reach about ten local conservators by phone to attend a tactical meeting planned for 8:30 Saturday morning. Other staff members enlisted spouses and friends. All converged on the scene prepared to assist in the recovery, including a number of temporary staff (hired to pack up collections) and our professional movers, Hebard-Porter (contracted to move and store our collections in warehouses off-site). We were lucky that most of the collections stored in the basement had been moved out already. That week the remainder of the huge costume collection had left, and the Society's most important paintings had been moved to their temporary quarters on the third floor. Newspapers and architectural drawings had been scheduled to move within days when the flood hit. 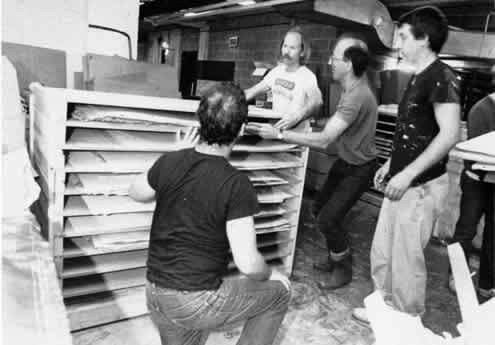 Because of the variety of materials affected by the flood (bound and unbound newspapers, architectural drawings, paintings, frames, and sculpture) separate salvage crews were each headed by conservators with the specific expertise needed to supervise recovery details for different materials. Each format required different techniques for recovery, and different routes for removal. Not all materials could be salvaged at the same time because of the limited access and availability of "above-water" space in which to prepare the collections. 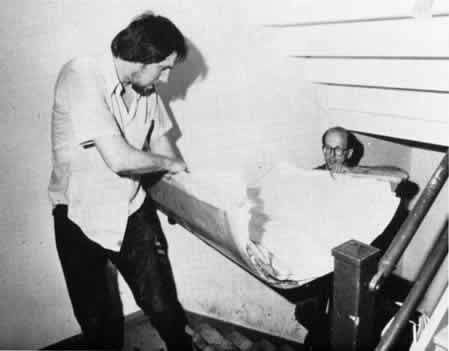 Since there was no electrical power to operate elevators, water-damaged materials had to be hand carried up stairways from the basement to stations where they could be packed for transport. The basement has two levels with the heating, air conditioning, ventilating and electrical systems located in the lower level where water reached a depth of over four feet. It took all weekend to pump water, and even longer to clear wet sand from this area, delaying access to sculpture storage in the raised plenum beneath the auditorium. The closed metal door to the storage area, which is four feet above the basement floor, minimized access of the water to the sculpture. However, many pieces such as marble, bronze and plaster busts, were resting on the floor. Silt deposits and tidelines remained on about 100 of these objects after the water level receded. Water also rose to a depth of four feet in the painting storage area. Many of the 200 paintings, and as many frames, remaining in basement storage were submerged or standing in water after being knocked from racks to the floor by the force of the water. All had been exposed to the damaging effect of steam. The electricity did not short out when the flood hit, so standing water heated through the night creating steam which compounded the damage to paint, gesso and gilding. The water level had dropped considerably by Saturday morning after being pumped all night, but it was still necessary for the recovery crew to wear chest-high waders. Each of the paintings was removed individually, and passed to other crew members who carried them outdoors to a station where they were inventoried and unframed by a painting conservator and his assistants. 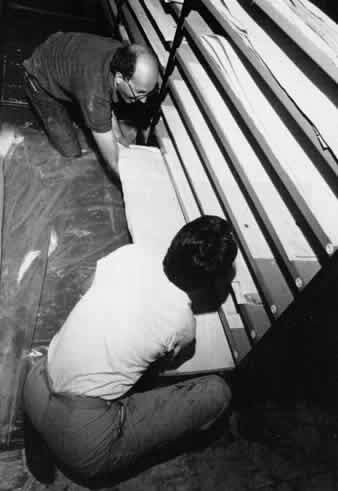 Once the paintings were moved to the conservator's studio at the Chicago Conservation Center (a private conservation facility near the Society), documentation and emergency treatments were conducted. Two years later, three quarters of the damaged paintings have been conserved and returned to the Society. Only fourteen out of 174 paintings were regarded as total losses. Bound newspapers and architectural drawings had been stored, fortunately, at a higher level in the basement, or water-damage to the paper collections might have been many times what it was. The water had retreated to lower parts of the basement, and by morning, an area had been cleared and portable generators provided electricity for some light so that work could proceed. Salvage operations for both bound newspapers and for architectural drawings had to share the same workspace. The decision was made to move out all wet materials first, and following that, the remaining paper collections that were above the water line. It was essential that all paper collections be removed from the site as quickly as possible because environmental conditions were at their optimum for mold growth. Fig. 6. Newspapers forced off shelves by flood water. Because removal of the architectural collection would be a more complicated, time-consuming operation, it was decided that bound newspapers would be moved first. Four hundred of the 2400 volumes of newspapers stored in the basement were wet to varying degrees. Some had been washed from the shelves by the force of the water, and toppled over one another onto the floor. (Fig. 6) If they were very wet, they assumed distorted shapes as they lay over one another. Papers in the basement dated from 1872-1973. Our pre-1871 papers published before the Great Chicago Fire had been stored in the third floor library and were never at risk. Fig. 7. Newspapers moved up stairs. Human chain. Fig. 8. Newspapers shrink-wrapped to pallet. Bound newspapers had been recently wrapped in anticipation of their move off-site. A heavy archival paper had been used, and they were fortunately sealed with a self-adhesive tape that did not release when wet. The wrapping proved to be additional protection for the bound volumes in limiting access of water by holding the bindings tightly closed. Swelling was thereby reduced, as well as penetration of. the fine silt carried by the water. The wrapping also made it easier for the recovery team to handle the large, heavy volumes (some up to 30 lbs.). They were passed from one person to another in a human chain up the stairs where they were inventoried, stacked on pallets, shrink-wrapped and loaded into a refrigerated truck. (Figs. 7, 8) In contrast, the smaller number of unbound newspapers housed in archival boxes faired poorly. The boxes disintegrated, and the papers were exposed to the effects of the rushing water, sand and silt. By 5 pm on Saturday, the wet newspapers were in freezers. The first 100 volumes were taken to Graphic Conservation Company, a private conservation laboratory located within minutes of the Society. Graphic Conservation had a 216 cu. ft. walk-in freezer on its premises. Later, a Society trustee negotiated with Sara Lee Kitchens, a large commercial bakery located in a Chicago suburb, for storage space in their giant holding freezer for the rest of our water-damaged collections. 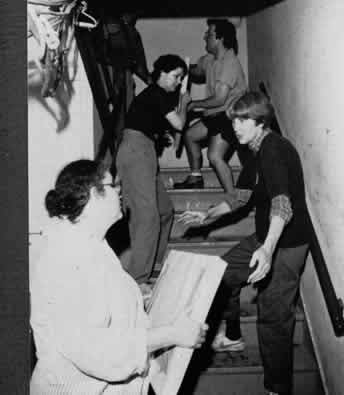 The removal of newspapers from the basement dominated salvage activity until about mid-afternoon, giving another crew time to consider their approach to saving the architectural collections. The drawings had been stored in manually-operated compact shelving. Sand and silt that had filled the tracks made it harder than usual to move them. The door to the area had been closed, so the amount of water that entered the space was limited. As a result, only the bottom-most shelves of drawings were wet. Another inch of water would have doubled the amount of wet material and the salvage effort. It is estimated that 13,200 drawings were affected by the flood including renderings, blueprints, starched linens, tissues, Mylars, full size negatives of drawings, Hectographs and other processes on a variety of paper supports. Folders each held from 1 to 50 flat drawings, and there was also a large quantity of rolled drawings. Several makeshift tables were assembled to accommodate the oversized folders of drawings. The light was dim, and the floor still wet and muddy. Some packing supplies such as sheet cardboard and blank newsprint were already on hand because they were being used to pack collections. 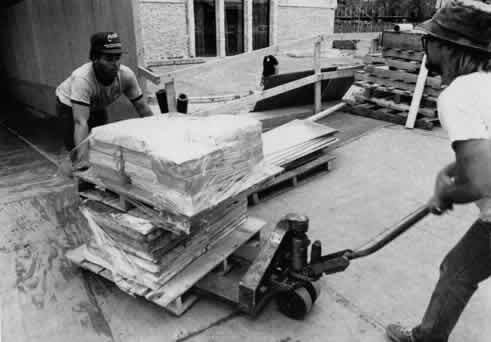 Pallets, shrink-wrap, cardboard cartons and more newsprint were provided by our professional movers, and other miscellaneous supplies such as buckets, paper towels and clean water were brought from elsewhere in the building. Fig. 9. Narrow spaces between compaction units. Fig. 10. Heavy, wet drawings were hard to handle. Fig. 10b. Cleaning sand and silt from drawings. Fig. 11. Carrying drawings up stairs on a sling. Fig. 12. Drawings being loaded into freezer truck. When the flood hit, about 200 select drawings from the architecture collection were awaiting photography in the photographer's studio which was also located in the basement. They were rushed to Graphic Conservation Company where they would receive immediate attention. Conservators there who were not directly involved in salvaging our collections received the water-damaged objects, examined and inventoried them, and began emergency treatments as needed. Only one telephone in the building was operable. A call to Blackmon-Mooring Steamatic Catastrophe, Inc., of Ft. Worth, Texas, referred to us by our insurance company, put us in touch with the disaster-management firm we contracted with to clean and stabilize the building environment. They quickly dispatched their experts and a local workforce to remove wet sand, to mop, scrub; and to fumigate the basement. They also provided equipment to circulate the warm, humid, and very still air throughout the museum. 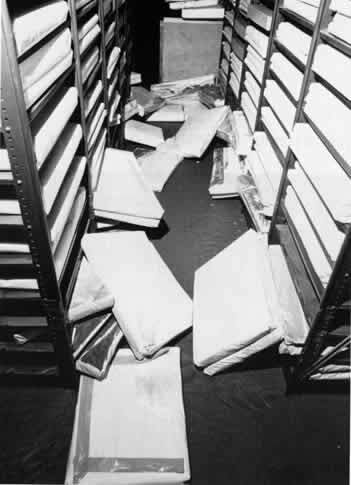 Within 44 hours of the disaster, all the wet materials were safely frozen, so attention could be turned to the needs of remaining newspapers and drawings on the basement shelves. They had not been touched by the flood water, but they would continue to absorb moisture from standing water and wet sand. By 5 pm Sunday, another 2000 volumes of newspapers were removed to the warehouse where other collections had taken up temporary residence. Because many of the newspapers had been microfilmed, access for the public would not be a critical issue. The architecture collection, on the other hand, is regularly used by researchers, so it would be necessary to maintain their accessibility even in the warehouse. Temporary shelving units had been planned so some of the required construction materials were already on hand. Fig. 13. Breaking down compaction units. Fig. 14. Loading temporary storage units for drawings. Most of the architectural collection was out by the end of Monday, but we still needed to attend to rolled Mylars and negatives. 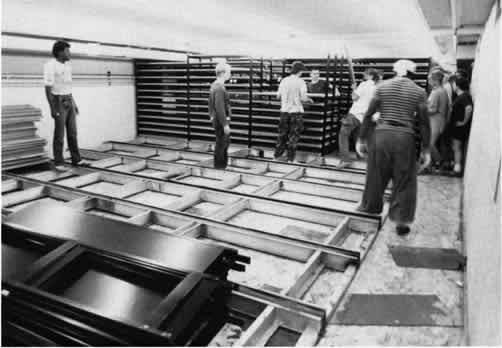 Mylars were wiped of sand and silt, then they were air-dried on top of Kraft paper which was available in long sections, in galleries and lobbies. The museum would be closed to the public for a month and a half giving us time to achieve some environmental control since much of the HVAC system had to be replaced. We made use of the public spaces to lay out some of the recovered collections. Rolled negatives were difficult to salvage. Their gelatin emulsions were soft, perhaps not hardened as are photographic emulsions, so that as they began to dry, the gelatin surfaces stuck together. There was a great deal of loss to these objects. They may have been more manageable had we attended to them sooner, however, we knew that the collection also included the original drawings from which the negatives were made, so we did not spend time unnecessarily trying to preserve them. Last to be salvaged was the massive heap of wet-; sandy blueprint drawings of the Society's own buildings. They were pulled from a boiler room where the depth and turbulence of the flood water may have been at its worst (judging from damage to equipment in the area). We decided to clean all of the drawings and air dry them, then later we could calmly select drawings that were essential to the future maintenance of the buildings. Freezing water-damaged collections buys time for thorough investigation into the methods of freeze-drying, and for the selection of a dependable contractor to carry out the work. Sara Lee Kitchens had been very generous in providing emergency freezer storage space. Their concern for the safety of our collections while in their facility far exceeded our expectations. They held our collections for over a month. In retrospect, we wish it could have been just a little longer. As far as we knew, no institution had dealt with the quantity of large, flat, water-damaged objects that we had. Even the large, heavy newspaper volumes seemed to present an uncommon drying problem. We didn't want to use a drying system that would allow ice crystals in the paper to thaw, possibly causing tidelines to form. inks and colors to bleed, and coated surfaces to block. Unlike collections of corporate or medical records, our collections are important not only for their informational value, but for their artifactual value as well. Fig. 15. Document Reprocessors mobile freeze-drying chamber. We selected Document Reprocessors based in San Francisco to do our freeze-drying. 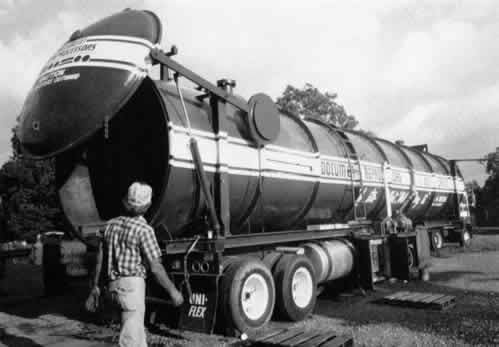 The company uses large, mobile vacuum chambers that are intended to be moved to the site of a disaster to dry water-damaged materials. (Fig. 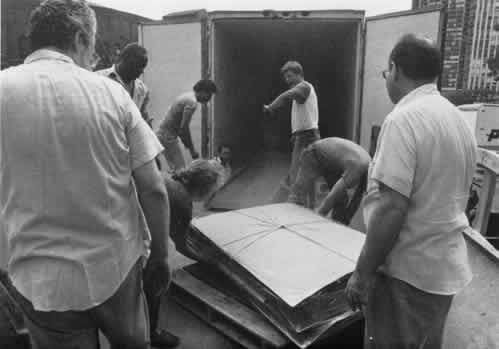 15) Unfortunately for us, the unit that had been recently adapted to do freeze-drying, our chosen method, was located in Rochester, New York, and could not be routed elsewhere until the new equipment had proven itself, so Document Reprocessors transported our frozen paper collections 600 miles by freezer truck to Rochester. It was necessary to repack the drawings for shipment before leaving Sara Lee. Eric Lundquist, owner of Document Reprocessors, supervised the operation. 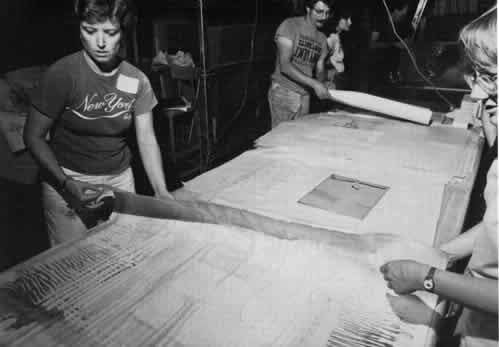 Groups of drawings were slipped into the centers of large, broken-down cardboard cartons so they were protected with double layers of corrugated on both sides. The intention was to conserve space in both the freezer truck and the vacuum chamber since pallets could not be stacked. 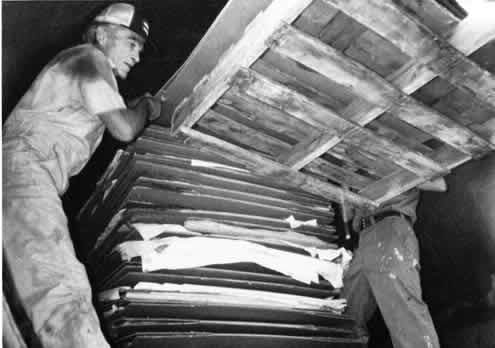 Newspapers were also removed from pallets and traveled to Rochester in open cardboard cartons. The new format for the drawings did allow for stacking to any height, but there were disadvantages to consider. Repacking shuffled the order of the drawings and subjected them to a lot of additional, handling. The act of stuffing them between two halves of cartons was hazardous, and as the work was carried out on the loading dock where temperatures were considerably warmer, some thawing may have occurred. Early on we decided that some staff member would be present at any time our collections were being packed, transferred or examined by a contractor. The Librarian and Curator of the architectural collection observed the repacking of their collections at Sara Lee. I, as conservator, traveled to Rochester when the load arrived there and was scheduled to be transferred into the vacuum chamber. We selected Document Reprocessors to do our freeze-drying because of the company's reputation in dealing with a number of library and archive disasters. Their system allowed us some control over the temperature at which drying would occur. Some heat was required to promote the process of sublimation. We requested that the temperature not exceed 80º F. We wanted to avoid accelerated aging of objects that dried faster than others. The differential is considerable between the temperature at which objects in the vacuum chamber are kept frozen (-20º F or lower), and the heat introduced to initiate sublimation. In a vacuum, these conditions result in high molecular activity. Molecules break away from surfaces of frozen objects, and in the case of Lundquist's system, are evacuated from the chamber as water vapor, without passing through a liquid phase. Heat is introduced in Lundquist's system through a series of "platens" of copper tubing through which water and anti-freeze flow. The platens are layered between the boxes of books and packages of drawings to distribute the heat where it is needed. Drying time is dependent on several factors: the size and density of objects, degree of wetness, the size of the load (ours was approximately 650 cu. ft., a full chamber), and the temperature at which freeze-drying occurs. At higher temperatures drying takes less time, but there is the hazard of accelerated aging. One and a half months were required to dry our collections after some adjustment in stack height of drawings in the chamber. We thought at first that the thin, interleaved drawings would dry very quickly without much heat. The stacks took on a convex form in the center which did not conform to the flat platens. To be effective, they must be in contact with the material to be dried, so they were not used initially. When we found that the drawings were not drying without the heat from the platens, they were inserted. (Fig. 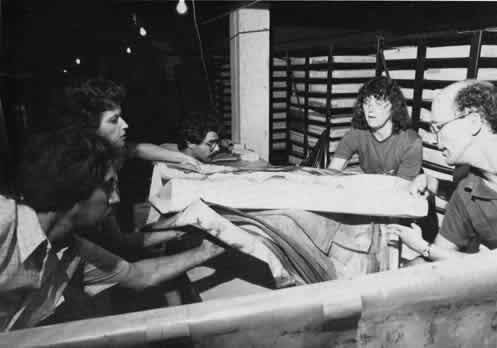 16) Half of the newspapers were dry by that time (three weeks after drying began) so they were removed from the chamber, and remaining wet materials were redistributed. We knew that the freeze-dried collections would have to re-humidify once they were dried and removed from the chamber because the process would extract all the ambient moisture from the paper as well as the flood water. Under normal conditions, paper has a moisture content of about 8%. In a super-dried state, after freeze-drying, the drawings would be susceptible to damage from handling. Freeze-dried paper should not be handled at all until it reaches a moisture content of 5%. Fortunately, reabsorption progresses rapidly on exposure to the air. We planned to let the dry, re-packed collections sit in the truck for two weeks before returning them to Chicago. I did not return to Rochester this time to observe the repacking after drying was completed. A date for the return of dried collections to the warehouse in Chicago had been agreed upon, but the truck arrived 5 days early. It had traveled through a heavy rainstorm. We found the collections poorly packed inside the trailer. Newspapers were stacked too high, and had toppled. Since the load was not properly secured, it had bounced, or vibrated to the rear of the trailer. Pallets of drawings were found lodged against the doors where rain entered and dampened some packing material. The corners of a group of drawings that protruded from beneath the packaging absorbed some black grease from the floor of the truck. It seemed that for the contractor, drying the load was his only responsibility. We wanted our collections returned safely too. That was part of the deal. At the warehouse back in Chicago, the dried collections were moved into their respective storage areas. Several people were hired to assist in the re-processing. The bound newspapers still had a lot of sand and silt stuck to their wrappers. Most of the wrappers had been torn open in Rochester in order to test for dryness. Each volume was stripped of its wrapper, vacuumed and brushed to remove remaining sand and silt, then it was re-wrapped in fresh archival paper. They were then placed in a vault to rehumidify where conditions remain very stable. Incidences of distortion in the bound volumes could be traced back to the effects of the flood. Water had forced the volumes off shelves, and if they were very wet, their weight caused them to bend over one another. Since they could not be re-shaped while they were still wet, the dimensional distortion persisted after freezing and drying. It took 2½ months and 5 people working full time to reprocess the 13,000 architectural drawings returned from Rochester. The task was complicated because the order of the drawings had been broken. Repeated repacking and stacking, and the loss of information on folders that were discarded during the recovery process both contributed to the confusion. The drawings had to be recataloged. Detailed worksheets were prepared to fully document the drawings and their conditions following flood damage. The general assessment of the condition of the water-damaged architectural collection after freeze-drying is that no irreparable damage had been inflicted by the flood. Tears and cockling could be repaired and flattened. The care taken in preparing the collection for freezing and freeze-drying was well worth the time and precautionary measures applied. Two years later, Chicago remembers the Society's flood and the way its collections were miraculously saved by modern technology, skilled craftsmanship, and co-operation. The disaster had some immediate effects. With input from other local museums and libraries, the Newberry Library initiated and produced a data base for disaster recovery which lists the names, addresses and 24 hour phone numbers of emergency services, suppliers, and individuals willing to assist in the event of a disaster. The information will be periodically updated, and is available to any institution in the area on request. The Chicago Area Conservation Group formed DRAT (Disaster Recovery Assistance Team), a volunteer workforce consisting of conservators and other individuals offering labor, specialized skills, transportation and equipment for disaster recovery. The membership is included in the Newberry's data base. 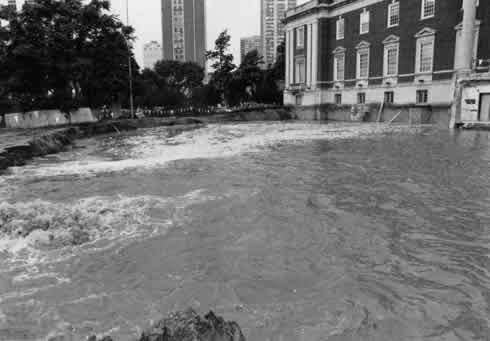 The historical society's flood has also inspired many of the areas institutions to begin writing their disaster plans, including the Society itself. The local news media had followed the flood closely, and reported regularly on developments. For some time after the event we were asked for updates of the salvage effort. Publications like the Reader, Chicago's free newspaper, followed up with a lengthy and very detailed report on the flood and its aftermath. (See References) Chicago's public television station, WTTW, has produced two ½ hour video programs on the Society's flood. The 2nd, aired after nearly two years of production, recaptures the event through interviews with direct participants, and follows the conservation treatment of one of the water-damaged paintings. These reports have heightened the public's awareness of the commitment of museums and libraries to the preservation of their collections. 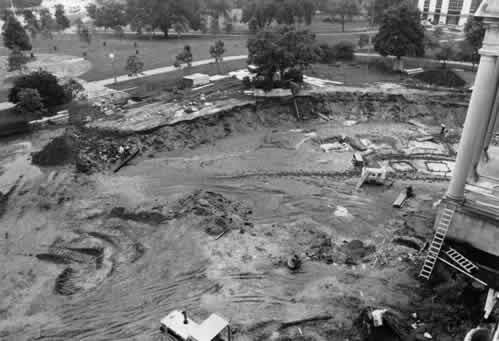 The Chicago Historical Society's flood came at the very beginning of a two year period of disruption and change, all of which was basically the result of being under construction. The cause of the disaster is now linked to construction equipment. A huge back hoe, or shovel, struck the water main an hour or two before it burst. Since we were already about six months into our construction mode when disaster struck, we had sufficient time to get our support systems lined up. A professional mover had been contracted to move and store our collections in warehouses for the two years we would be under construction. We had hired many temporary workers to pack up the vast collections, and to plan the move and accessibility of collections in the warehouse. Collections are slowly returning to the museum now, in the same planned, and well-organized manner. To prepare large, fragile collections like costumes and decorative arts, huge quantities of packing material are required. They were on hand when the flood hit, and we knew where we could get more when supplies ran out. Chicago is fortunate to have two private conservation facilities, and both in very close proximity to the historical society. The conservation centers, and their individual conservators were key figures in the success of our recovery. They had previous experience with disasters, and their facilities and personnel could accommodate our urgent needs. Fortunate as well is the close network of Chicago area conservators, a relationship which is promoted by the Chicago Area Conservation Group. About 15 conservation specialists responded to our emergency. The conservators not only directed, but also took active part in recovering our water-damaged collections. The Society, like many institutions, did not have a disaster plan at the time of the flood, yet all these positive forces, and an incredible spirit of co-operation among staff and volunteers combined to make our flood less disastrous. Schmidt, David J., Freeze-Drying of Historic/Cultural Properties: A Valuable Process in Restoration and Documentation , Technology and Conservation, Spring 1985. Lundquist, Eric G., Mass Drying Techniques for Water Damaged Materials , Columbia University Seminar on Freeze Drying (Criobibliotherapy), April 1987. Henderson, Harold, After the Flood: A Restoration Drama , Reader, Chicago, Vol. 16, No. 1, Sept. 26, 1986. Paper delivered at the Book and Paper specialty group session, AIC 16th Annual Meeting, June 1-5, 1988, Vancouver, British Columbia.